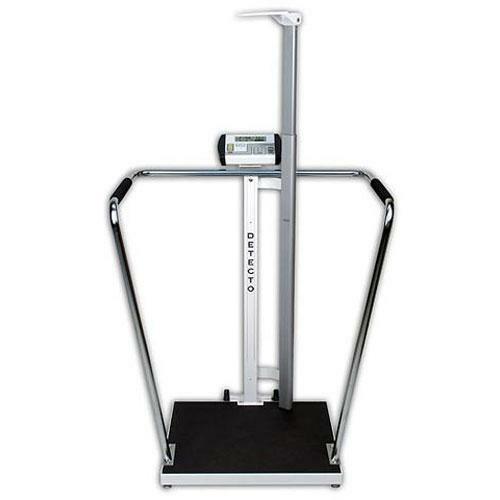 The 6854DHR USA-made bariatric scales are designed for optimum performance and display weight, height, and BMI simultaneously (shown below) by simply raising the digital height rod while a patient is being weighed on the scale. There are no keys to push, no operational sequences to memorize, it’s fully automatic. These bariatric scales are EMR-ready with USB, serial, and optional Wi-Fi. The ability to print or save weight data with these scales is a real time-saving device for clinics, doctor’s offices, long-term care facilities, and other medical institutions. 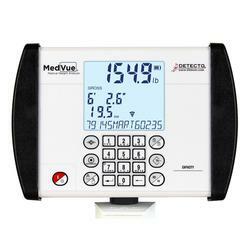 Detectos state-of-the-art MedVue® digital weight indicator includes DB9 serial, USB, and optional wired or Wi-Fi Ethernet output for data transfer to a printer or PC-based EMR (electronic medical record) software. With the time/date feature, the scale can send the weight, time, date, BMI (Body Mass Index), and height directly to a printer or a PC for record keeping. The 350-degree swivel mounting bracket allows it to be positioned wherever its easiest for viewing.